OVERBERG, South Africa --- Airbus Defence and Space has successfully tested a new type of aircraft that will aid the development of future unmanned aerial vehicles (UAVs) for series production. 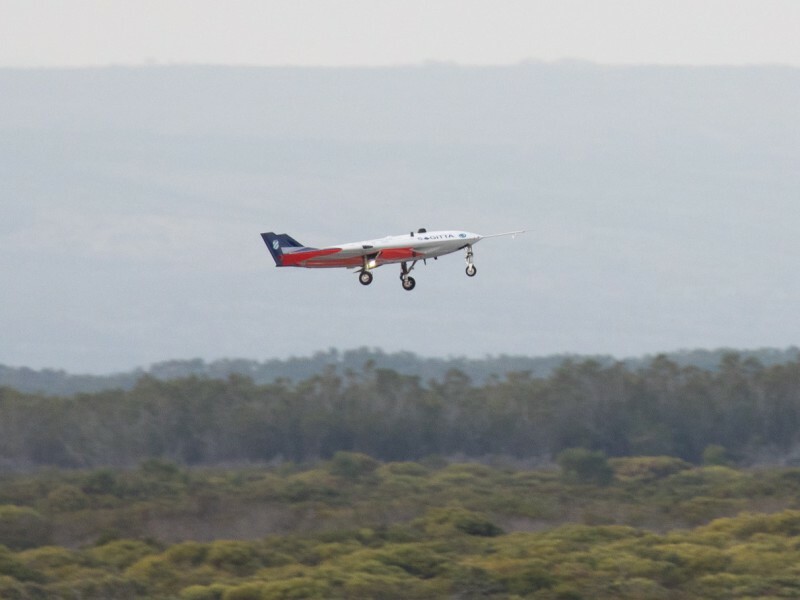 The unmanned, jet-propelled demonstrator with the project name SAGITTA flew completely autonomously for around seven minutes over the test site in Overberg, South Africa, on a pre-programmed course. The innovative flying-wing construction demonstrated excellent flight characteristics during the test. This flight marked the successful completion of the first test phase, which also comprised an extensive series of ground tests. The demonstrator is the product of the 'Open Innovation' / SAGITTA national initiative launched by Airbus in 2010. The project sees Airbus working together with institutes from the technical universities of Munich and Chemnitz, the University of the Federal Armed Forces (Universität der Bundeswehr) in Munich, the Ingolstadt University of Applied Sciences and the German Aerospace Centre DLR to jointly develop advanced technologies for unmanned flight. The project started with a feasibility study of the flying-wing configuration. Criteria for the design included a high degree of autonomy, variable mission profiles and low levels of perceptibility. To achieve this, the inter-institutional research team adopted approaches from academic and industrial research, developed these further and incorporated them into solutions for industrial application. Airbus facilitated the continuous exchange between experts, doctoral students and developers during the development stage. In addition, the Company provided the industrial facilities required for integrating the technologies in the demonstrator at Airbus Defence and Space's Military Air Systems Centre in Manching, Germany. "With SAGITTA's first flight, we have proved just how successful a cooperation between industry and academic partners can be in the area of basic research," said Grazia Vittadini, Head of Engineering at Airbus Defence and Space. "We are increasingly shifting our focus towards these kinds of innovative concepts, in particular for the development of UAVs, so that we can develop products quickly and efficiently for a growing market."